Owning a home or condo along the coast is something that many only dream of. The hope, of course, is that you can visit the area as often as possible. Arrive as planned, enjoy your vacation and not spend your whole visit taking care of home maintenance. OR worse yet, arrive to find $25,000 in damage! One of many true stories. At Atlas Premiere we know that it isn't easy to manage your property from afar. We also know that our owners need a partner that they can trust and would appreciate arriving to find everything in "tip top" shape with NO unexpected surprises! Atlas Premiere keeps detailed records of all of your preferred service providers and works closely with each of them to ensure your satisfaction. However, we can also provide these services and offer consolidated billing if needed. 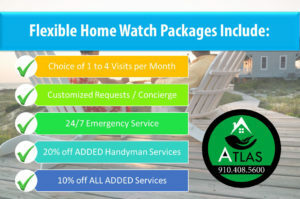 Our 2nd home maintenance packages are surprising affordable and your peace of mind is priceless. Starting at just $50 / visit and customizable from there based on your needs. Competitive pricing, consolidated billing and a single company that you know you can count on.